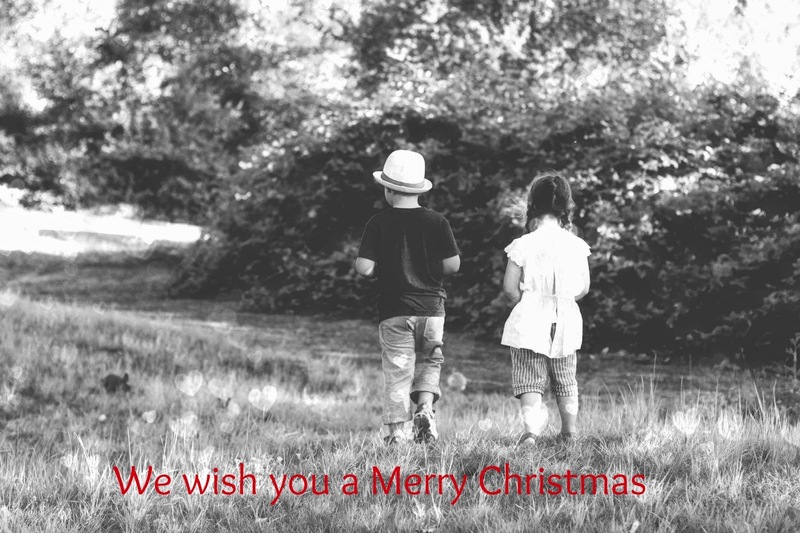 From our Family to yours we wish you the very best of the season- Merry Christmas - thank you so much for joining us on our adventures this year! Friends my wish for you today and every day is that you find peace and joy within yourselves and in your world- may your day be filled with love and your mug be filled with a hot latte! Warm hands means a warm heart- much love! If you will remember about a week ago Vancouver got a skiff of snow- a light dusting if you will- Friday however was the really big show- snow: part deux if you will! 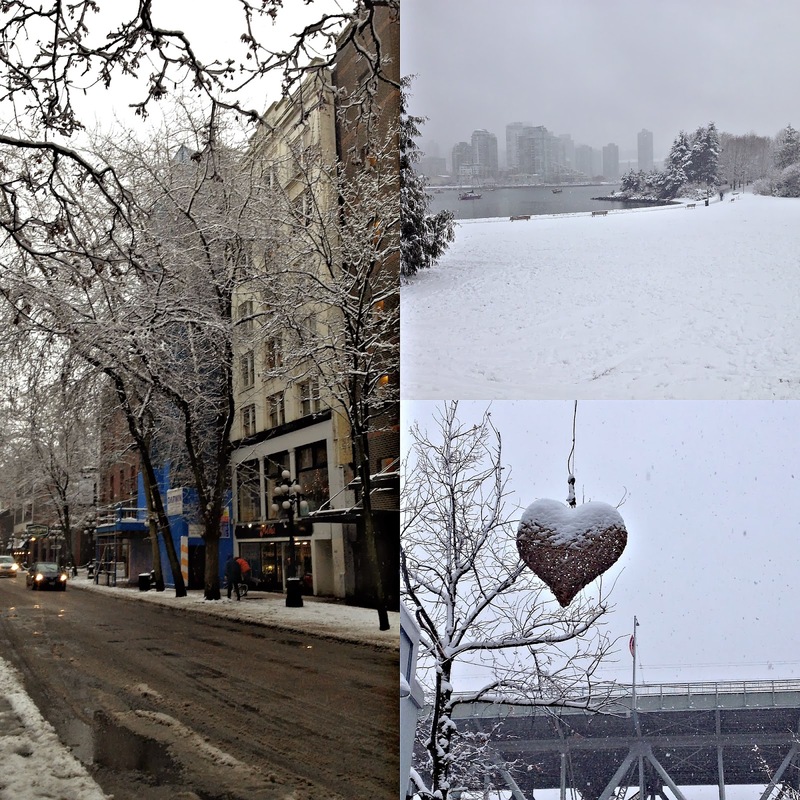 In fact it could have been a bonafide snow day in the eyes of many Vancouverites- it was just that much snow! 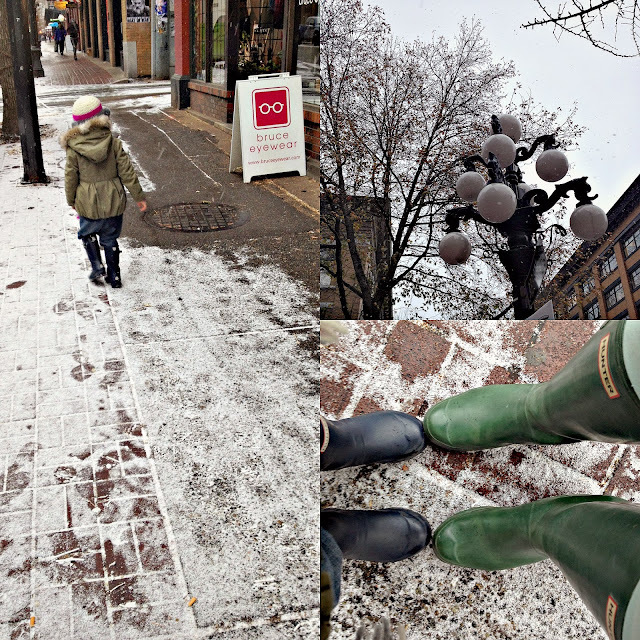 By now it will most likely have melted and become a distant memory to many of us- but I thought I would share Miss Lo's and my magical snow adventure-AKA how it took us almost three hours to get to Granville Island! We had a bit of last minute Christmas shopping to do and so we set out for Granville Island early on Friday morning- we walked over to the closets bus stop to wait for the direct bus to the island- we waited and Miss Lo frolicked in the snow- we waited and our mitts became sodden- we waited and our toes grew numb- the bus never came. 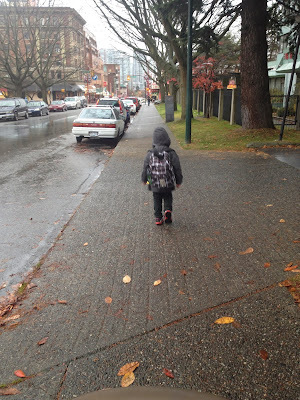 Not to bore you with all the details but we ended up walking from the closest sky train station to our destination. Once again with much thanks to serendipity what was just a run of the mill day became magical. One of the things I love most about Vancouver is that as soon as the snow starts falling folks disappear- aside from a few intrepid souls Miss Lo and I had the streets to ourselves- down through the slopes of Fairview we wandered down to the sea wall. making snow balls and playing along the way- enjoying how the snow becomes the universal equalizer- making all spaces clean and white. Aside from the occasional whir of stuck tires and the shrieks of school children on recess the air was quiet with the falling snow. We made finally made it to Granville Island- had our hot chocolate- bought our books and caught a bus home. By the time you read this the snow will be melted and life in this coastal city will be back to normal- but for one day we had this winter magic- a gift- perhaps just what we needed! Friends it is Friday - the last Friday before our two weeks winter break- to say this has been a long time coming would be a major understatement- this fall has been really long and really emotional. 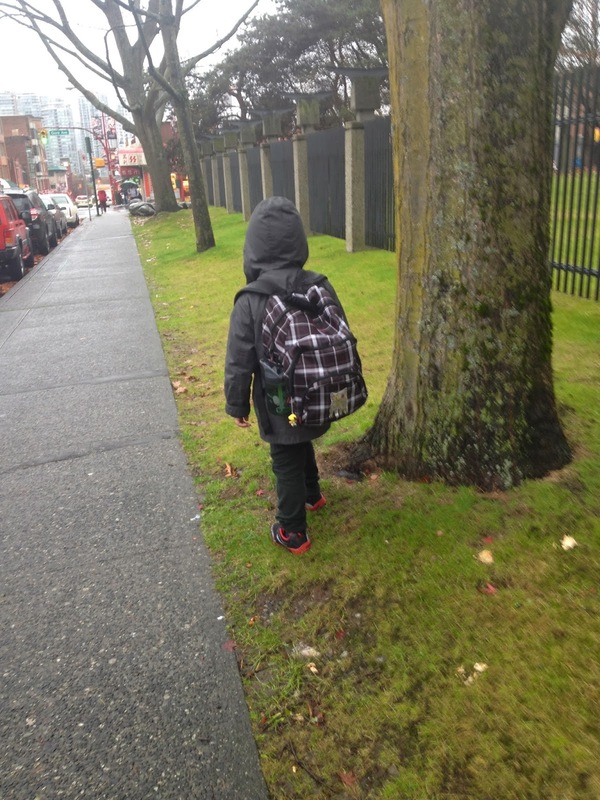 Settling into our school routine hasn't been easy for any of us- kindergarten has not been easy for the Boy- the Littles feel separated from each other and miss each other badly. 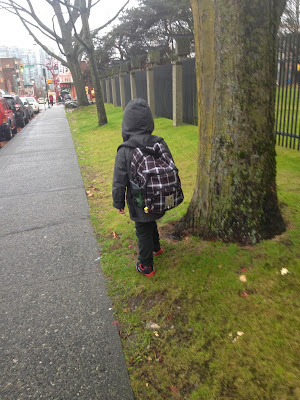 No one tells you upon entry to Elementary school that it won't be academics that your child will struggle with- the social learning curve is steep and rife with pit falls- I don't feel like we have hit our stride this year- not yet. At any rate I feel like I'm limping across some imaginary finish line as we get up and get going this morning- a "to do" list a mile long popped into my head before my feet even touched the floor. I'm struggling to find grace with in my morning- let alone find my slippers- I need coffee S.T.A.T! 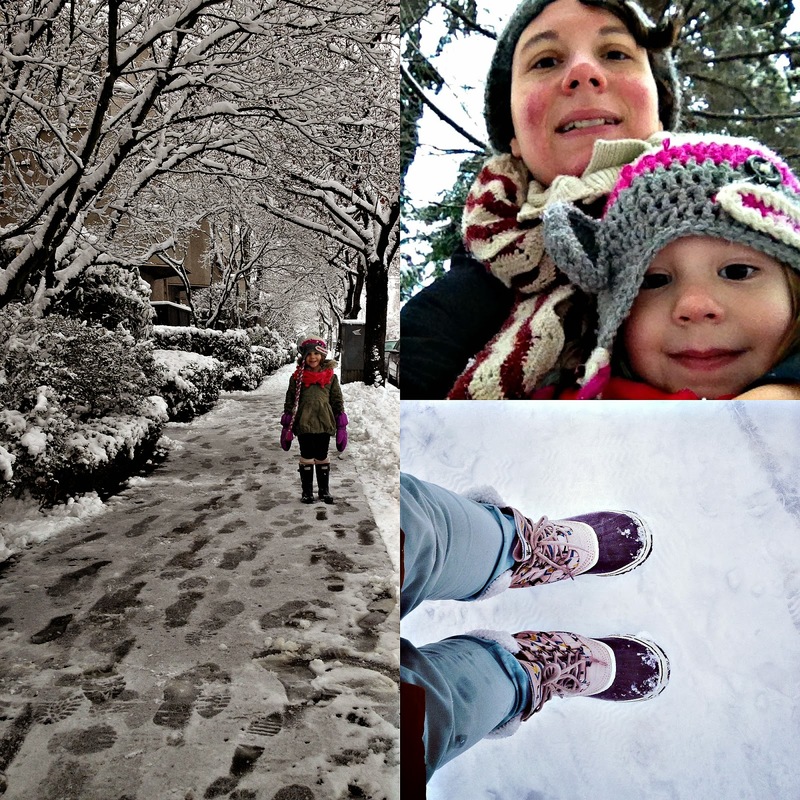 The Littles can sense my mood and are getting wilder by the minute- add in a few inches of fresh snow and their excitement is understandable. We are headed out of town soon- South to warmer climes and a new family adventure- just the four of us for Christmas- it will be different but I am sure good. I will still be posting here next week- keep your eyes peeled for updates of our California adventure! With my giant "to-do" list in mind I am going to sign off dear Friends- may your weekend be filled with joy and spiked egg nog! Happy Friday! 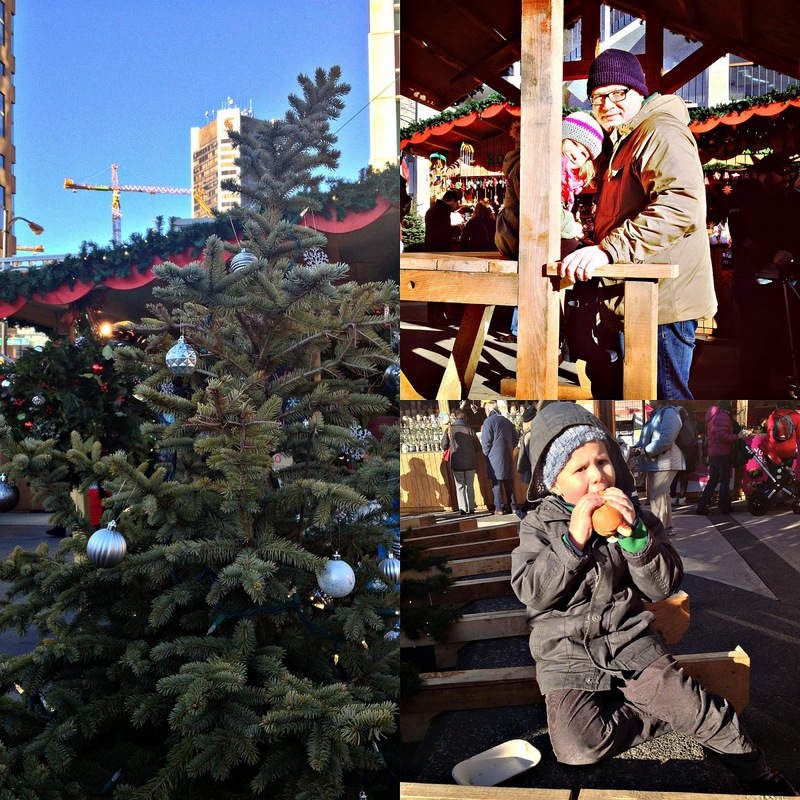 When yesterday dawned clear and (more than) crisp we decided that it was the perfect day to hit the German Christmas Market downtown Vancouver- set up just across from our local CBC studio- the market is a replica of the markets my Mother In Law is so fond of in her hometown. The boy stayed home from school for other reasons and so we felt a little lunch at the market was a good idea- we were all together to take part in what has - for our family- become a physical way for our Littles to connect with their heritage. The Christmas market is full of vendors selling all sorts of hard to find ornaments and goodies from Germany and around the world- special chocolates to put into the stockings- yummy treats to eat on the spot. Now while I realise that this market doesn't hold a candle in comparison to the ones in Europe it does the trick- we can have homemade Spatzle, Bratwurst and Mulled wine or beer- hot chocolate and gingerbread. It is small in comparison but our Littles don't know the difference- to them it is about recognition of German culture- the flag, beer steins and advent wreaths just like at Omi's house. Of course for us it really is all about the food- such a big part of our connection with their German heritage stems from the food- and again while the food at the Christmas market isn't nearly as good as at Omi's house at least it serves as a reminder- allowing our children to be familiar with it. More than anything I think is the feeling that surrounds you while at the Christmas market- the music and smiles on everyone's face. This little slice of Germany at Christmas has become a family tradition for us- while it sometimes seems like a hassle to battle the crowds for a Bratwurst we feel it is worth it. The carousal is always a hit with the Littles and yesterday was a special treat as a stranger gave us free tickets to ride- yay for the spirit of the season and the kindness of others! 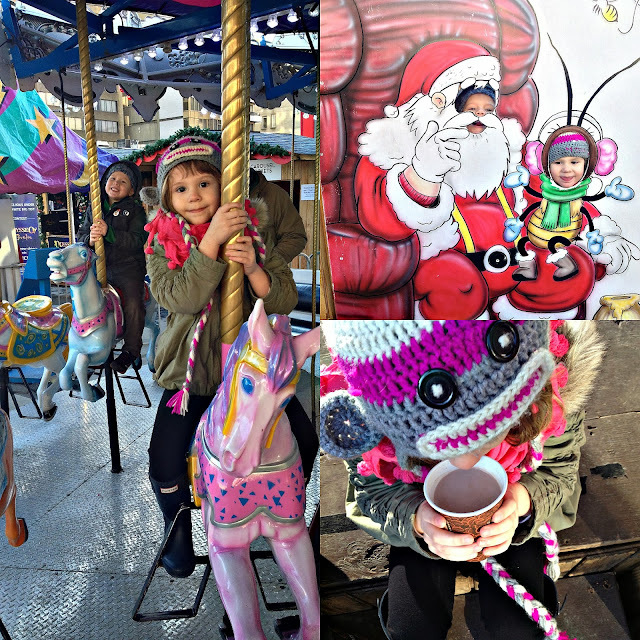 During this busy time of year it is easy to become overwhelmed with a list of things to do a mile long- you know me- I like to keep things easy and yesterday's impromptu lunch date at the Christmas Market was just that. A chance to reconnect and all be together- which is a special treat for us mid-week. A chance to just sit and eat a sausage on a bun in the chilly winter air- toes tingling- on a rare day of December sunshine! PS- since we were outside of the CBC we were approached by a reporter to talk about our family's Christmas Eve traditions- of course we talked about how the kids leave the room and then magically St.Nic visits and by the time the Littles get back upstairs he has left a stack of presents under the tree. So if you happen to be listening to the CBC over the holidays you might here us! As discussed a few weeks ago we are heading South for the Holidays- California to visit friends and of course Disneyland- which our kids still don't know about! They still think we are only going to visit our friends- they may or may not totally freak out when they find out our actual destination- so exciting! I have this strange belief that when going on a big trip or vacation a few new items of clothing are needed- this is especially true for our Littles- who may not be so little any more- they are growing quickly! 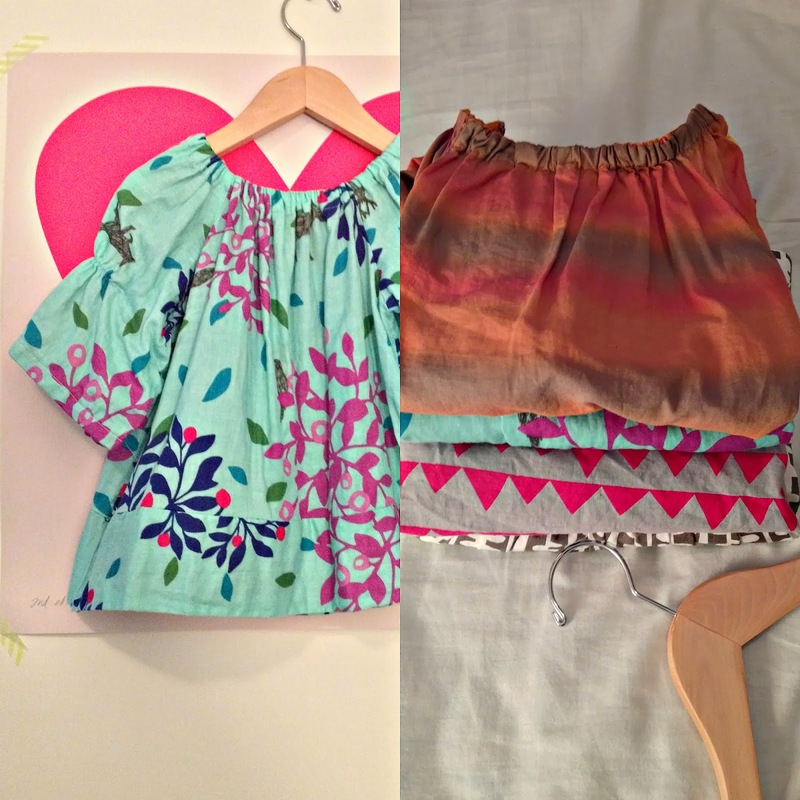 Warm weather clothes that fit a few months ago now fall short on legs and torsos- a bit of sewing was needed. Miss Lo got a few new tops- my favourite it this crazy, fun print recently picked up on a whim at Spool Of Thread- my go to fabric store for fantastic- different fabrics. 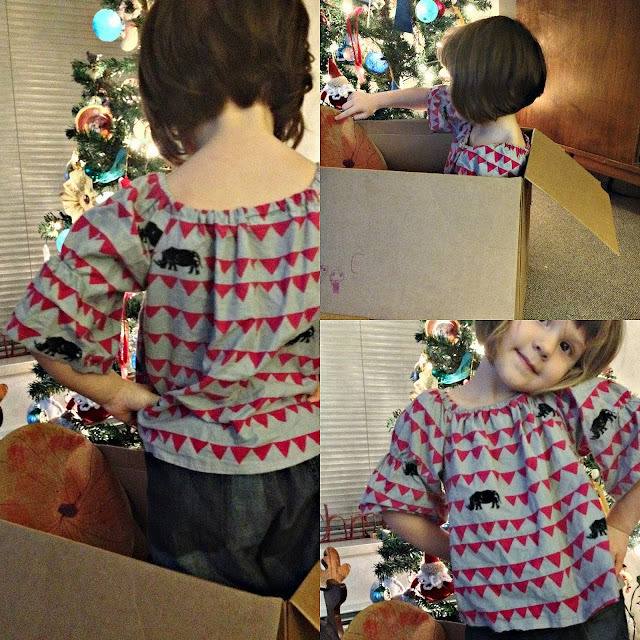 Sewn up in a simple smock top (pattern is originally from Sew Liberated) the banner/ rhino print is right up Miss Lo's alley! The second top is sewn up from some really pretty double gauze- also from Kokka- but purchased so long ago I don't even remember where I found it! This top I added a band at the bottom for a bit of added interest- I love taking a basic pattern and making it my own. So the stack of home sewn clothes going into the suitcase grows- we aren't packing much so I am hoping four tops for just over a week will be enough! My stack of sewing is shrinking as projects get wrapped up for the year- the last thing on my list are two pairs of Christmas pajama bottoms. I am going to do my best to stay out of Spool Of Thread this week- but there is some yummy dotted double gauze calling my name- Momma might need a new infinity scarf! Good Morning! As many of you know and are wondering about (Mom) this past weekend marked my foray into the Farmers Market scene. I know I had claimed to be finished with markets for the Holiday season but when the opportunity to participate in the Steveston Farmers and Artisans Market arose it was just too good to pass up- I jumped at it- and I am so glad I did! 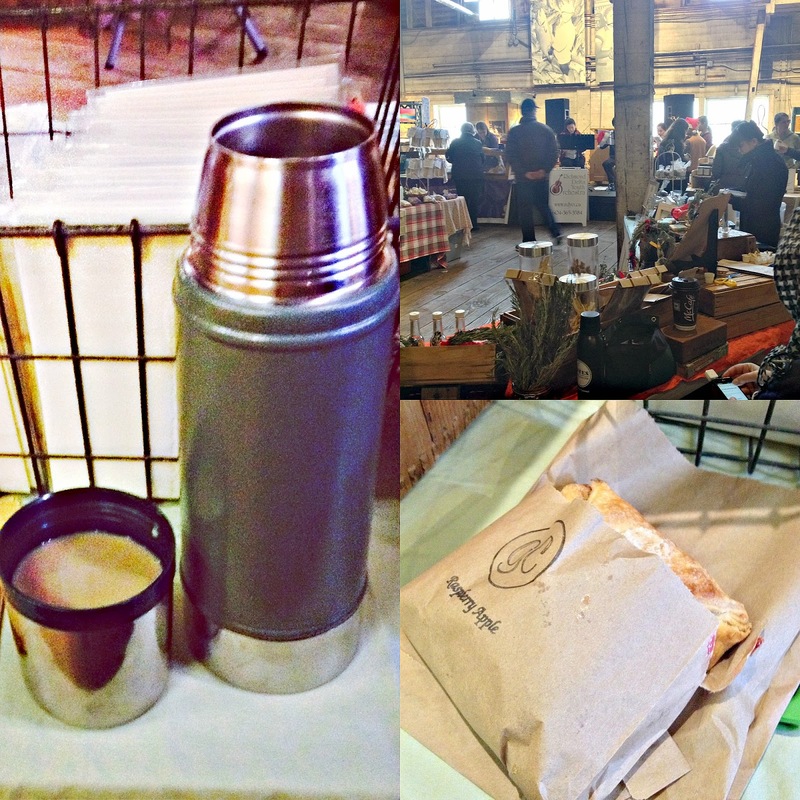 This may have been my first market as a vendor but I like to consider myself a bit of a Farmer's Market connoisseur- having visited a fair amount all over this fair province I feel I have an eye for a good market- and this was a good one! 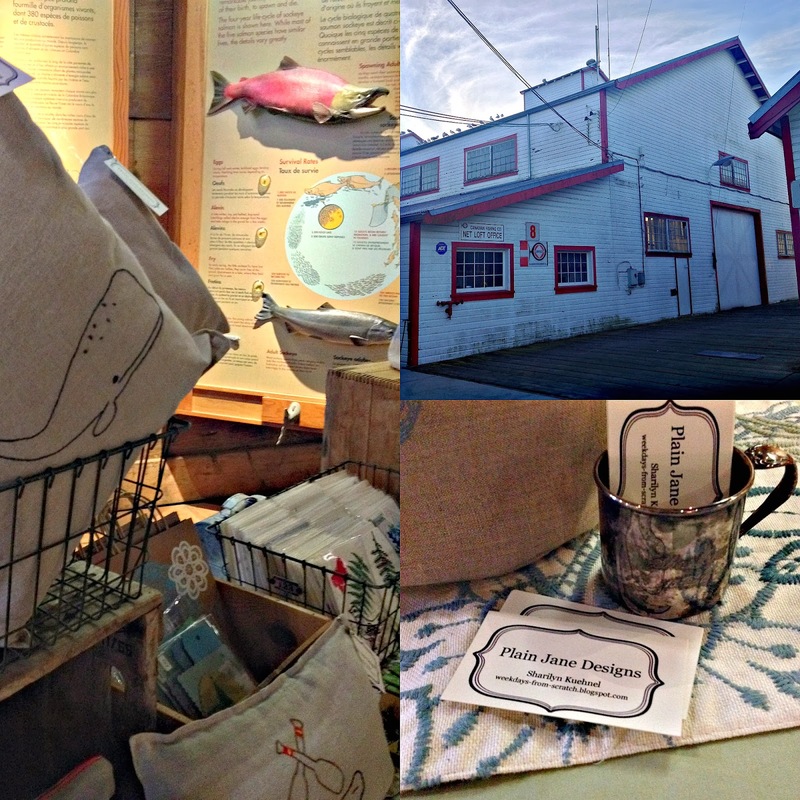 Located in the historic Gulf of Georgia Cannery the Steveston winter market provided a really good balance of locally made and grown goods- folks like The Sharing Farm were on hand with yummy honey and garlic along side home made Christmas decorations and adorable hair accessories for the kiddos. I spotted my favourite bread sellers- Uprising Breads- and their shelves were empty by the end of day! Swag bags as well as a craft corner were all set up for the Littles that came out with their families- and I noticed that pretty much ever vendor was handing out candy canes- our kids thought it was the best thing ever! Crafts and candy- they were in heaven! The afternoon was rounded out with a real treat- the Richmond Delta Youth Orchestra playing some real Holiday classics- the live music was a really nice touch that added to the over all festive atmosphere! The Steveston Farmers and Artisans Market runs through out the year- after a bit f a break in January the market resumes February 9- check the website for dates. I can't wait to do this market again- I had such a good time and everyone from organizers to vendors to shoppers were so friendly! The only issue I have with being a vendor is that I was busy behind my table and didn't get to do much shopping! 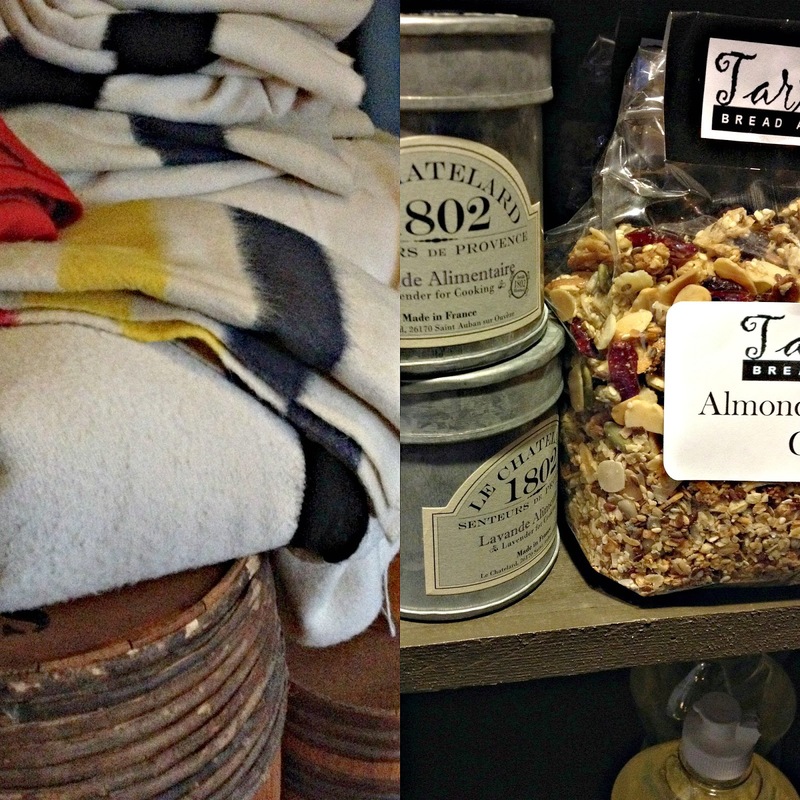 As much as I love to make gifts for giving I will be doing a small amount of shopping this holiday season- I'm keeping it local and visiting a few of my favourite haunts in and around Vancouver. Picking out special treasures by some of my favourite artists and makers- lots of yummy goodies to eat and pretty things to look at! With so many craft markets and events going on I thought I would give you my pick of the local pack- this is where I will be doing my shopping- and it's happening this weekend! 1. Rebecca Chaperon's Eerie Dearies is now available in person- check out Rebecca's web site for ordering details- I have been drooling over this project for months now and am so happy to finally be getting my hands on a copy- just in time for Holiday giving! Eerie Dearies is a collection of ABC illustrations bound together in a wonderful coffee table book. Also perfect for giving are any number of Rebecca's original mini iceberg water colours- each more special than the last- it can be hard to pick just one! 2. 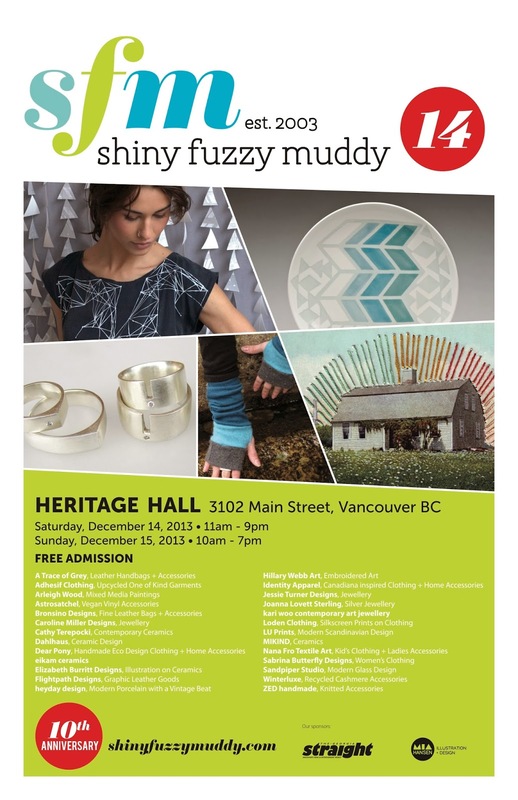 Shiny Fuzzy Muddy- the awesome collective of artists that make up Shiny Fuzzy Muddy are celebrating their 10th anniversary this year with yet another stellar line up at their show this weekend- Dec 14 & 15-located at Heritage Hall on Main street this show is really filled with vendors on the who's who of design in British Columbia. A few of my favourites are Cathy Terepocki- amazing graphic ceramics, Astrosatchel- vinyl totes and Dear Pony- loads of beautiful goods for the house and body! I am quite sure shopping the Shiny Fuzzy Muddy show will be an exercises in "one for you one for me"- I do tend to buy Christmas gifts for myself to put under the tree! The hours of this sale are very generous- Saturday 11- 9pm and Sunday 10-7pm- admission is free! 3. Le Marche St George- Winter Pop Up Shop- located in the garage beside the cafe and store this is a collection of carefully curated home goods and clothing from the folks with impeccable style- also available are a collection of my favourite ceramics from Janaki Larsen. The Pop Up Shop is open on weekends as well as by appointment during the week. Head on in for a look at some of the most beautiful linens and wovens for the home before heading into the cafe for a latte and the latest issue of Kinfolk! 4. The Steveston Winter Market- Perhaps I am a tad biased but I am really excited about this Farmer's Market- you know since I will be there with a table full of Plain Jane paper and home goods! While I am busy with my wares the Mr. and Little will be stocking up on all sorts of market goodies for our own celebrations as well as to give as gifts. 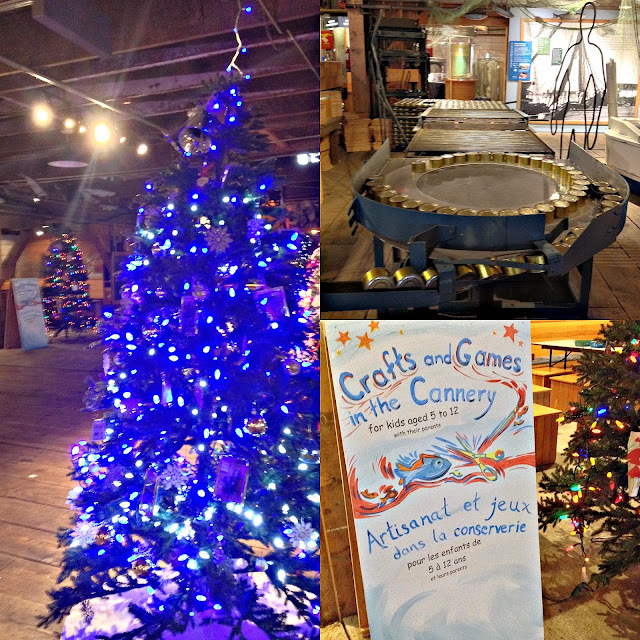 The Winter Market is located at the Gulf of Georgia Cannery and is open from 10- 3 pm on Sunday Dec 15- hope to see you there! 5. Community Thrift and Vintage- 311 Carrall street- this is my all time favourite go to vintage store- Community carries such an array of beautiful vintage finds as well as plenty of great items for the home- stop in to check out their collection of vintage Bay blankets or pick up a stunning outfit for New Years Eve! Friends it is Friday- I know I am posting exceptionally late today but only because we were in the Emergency Room with a bad case of the croup last night- I thought The Boy was having an asthma attack but it was the croup- now that we know what it is I feel better prepared to deal with it- he is fine and recovered with a full stack of pancakes this morning! I think last night was a good reminder for our family to keep things simple this Holiday season- our weekend will be filled with only the most essential of errands and events- the rest will be spent playing! Wishing you the happiest of Fridays dear Friends- I am now off to have my third latte of the morning! As I am wrapping up custom orders for the shop this week I am looking forward with excitement to a stack of Holiday sewing projects- sitting in line- waiting their turn- fun little things that take no time at all but are a pleasure to work on. Now obviously I can't reveal too much here yet but after the Holidays I will write all about these small pieces of sewing- can't wait! The beauty if a handmade gift given at Christmas or whatever Holiday you are celebrating- is that it kinda gets back to the essence of what this time of year is all about- it's a gift of service- a gift of yourself- your time. Today I feel that gift of time is more important than ever- for me making handmade gifts is relaxing and a joy- it's kind of my own form of vacation- splurging on special fabrics- laying everything out and all the while thinking about how this item that I am making will be used and loved. There are many ways to give a hand made gift that don't involve being being an expert or craftsman- Holiday baking- yummmm- this is a gift I love to receive because I am not very good at it! Homemade edibles are always a welcome and loved gift- soups, DIY cookies in mason jars, wine, jams, bread- I think one of the Mr.'s favourite gift ever was home made beef jerky! Of course there is literally the gift of time- coupons for baby sitting to the new parents are a heaven send- for that matter I think any parents would love that gift! If you have a skill give the gift of teaching your friends- how to knit, crochet, bead, make soaps, wood work- perhaps igniting a new interest for someone. So you see a gift doesn't need to come in a box- it can come in a jar or bottle or can- it can come off your knitting needles- it can come off a lathe- from pliers and scissors and glue! "Things" are so accessible these days- if I need something I can easily go to the store and buy it- weirdly enough what is not so accessible these days is our time and energy. Getting back to the spirit of Christmas and enjoying the time leading up to it as much as the day it's self I feel is key- I don't want to be in a mall feeling harried when the music is shouting at me to "be merry and bright"! I want to be at my sewing machine actually being 'merry and bright"- making something for a loved one. 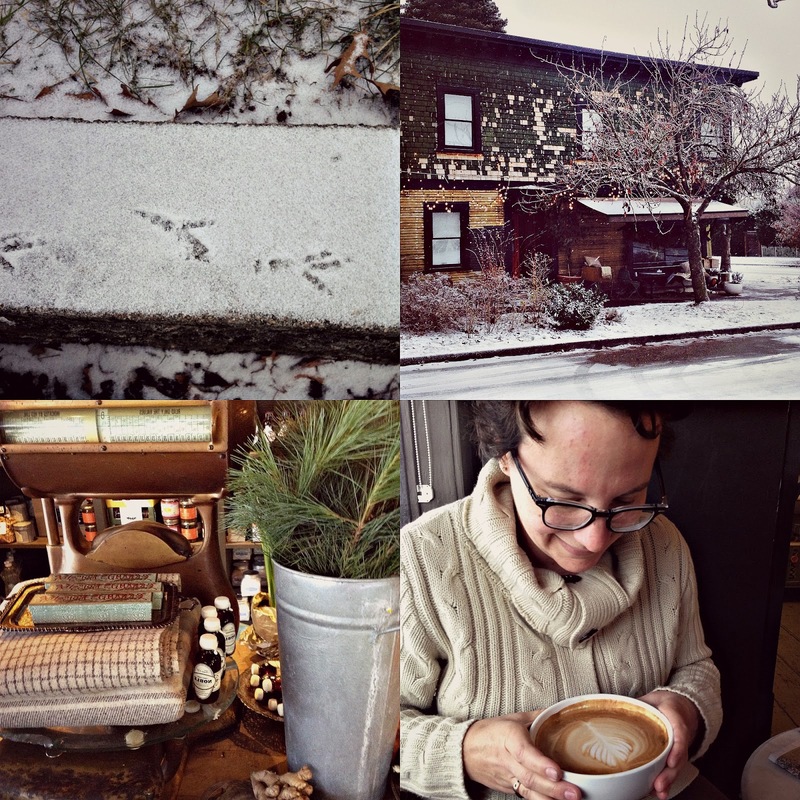 December Studio Update- and A Bunch of Mushy Thank Yous! Life seems to be flying by ever so fast these days- I can feel the days until Christmas slipping by- I blink and somehow my day is done! Yesterday I took a Momma time out- time for coffee with a dear friend in the snow at one of the most charming places in Vancouver- Le Marche St. George- which was made all the more charming by the quiet of the falling snow. Some days I need to just leave the dishes and laundry- walk out the door and have someone else make me a beautiful latte! So many exciting things have been happening in the studio these past few weeks- I am ever so happy to announce that my hand embroidered pillows can be found at a super cool little record store- Dandelion Emporium on Main Street! I am very proud of this last batch of pillows- the images that are appearing on the linen- arrows, whales, anchors- oh so good! I have also been doing some fun crafting this past week- while it is widely known that I am not a fan of wrapping gifts- I really do enjoy making tags- I love the little embellishments that make gifts special- fresh sprigs of pine, sea shells, stamps, twigs- all things natural and vintage often make an appearance on gifts that I am giving. 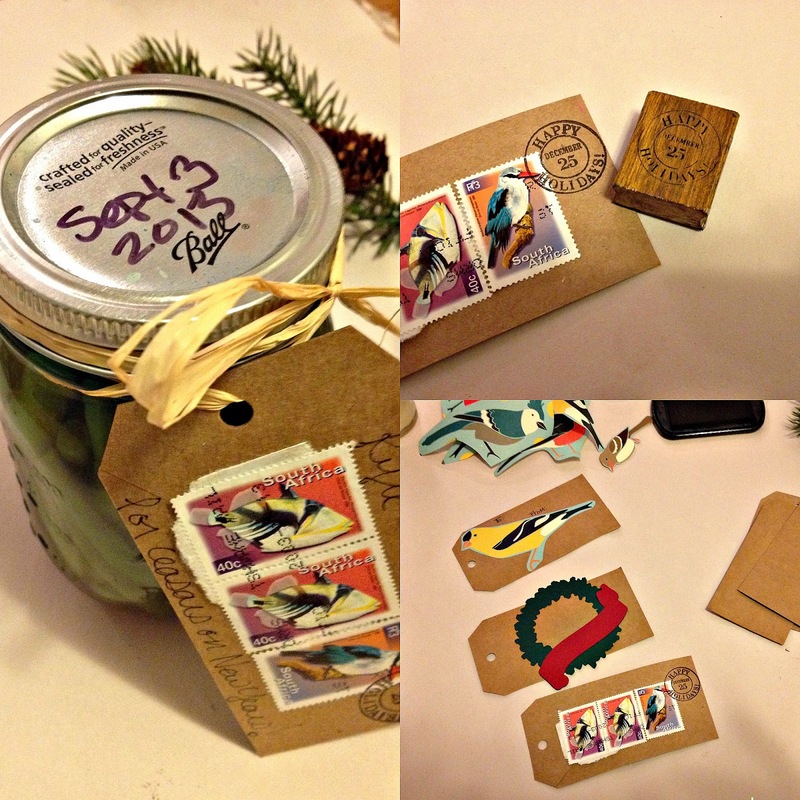 When combined with natural Kraft tags the most simple of elements really pop- these are almost as good as giving cards! 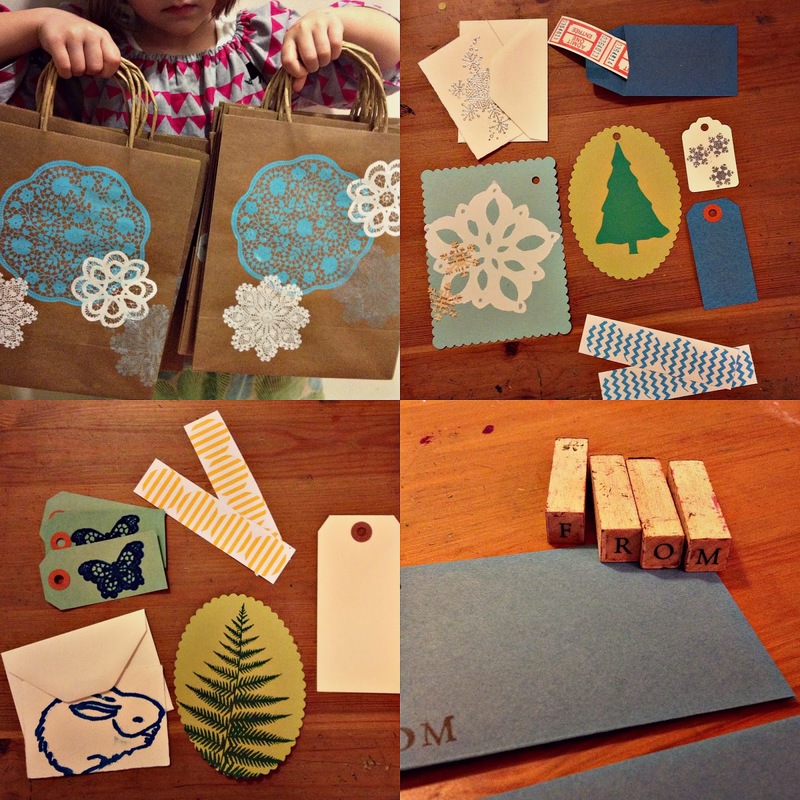 I encourage you all the search around for some scraps and ephemera and a glue stick- see what sort of personalized tags you can create! For my charming friends who don't wish to make their own tags I do have a new selection of charming tags and gift wrap going into the shop today- packages of six or more assorted tags and stickers are the perfect thing for the finishing touch on a special package! These will also all be available at the Steveston Farmer's Market this coming Sunday and the Gulf of Georgia- which I am ever so pleased to be a part of! We all know by now my passion for Farmer's Markets- I strongly believe in the community that springs up around such events- supporting local food producers and artisans. The Steveston Market is held in a building that is a 118 years old- and a national historic site- most days the public is charged admission to enter- on market days they rely on admission by donation. 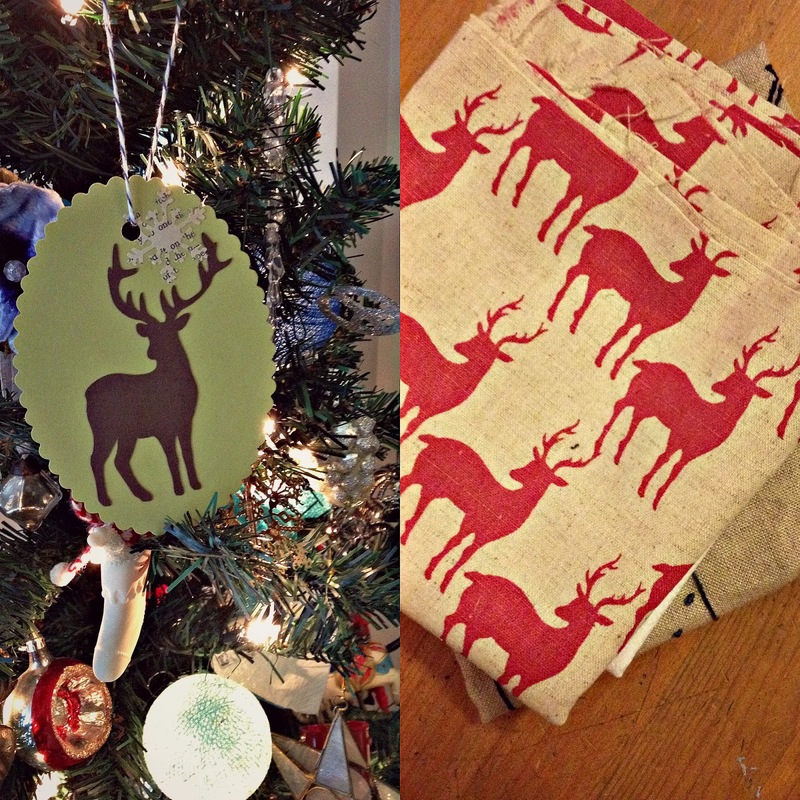 Plain Jane will have lots of last minute items on anyone's list- tea towels, pillows, zipper totes- in addition to screen printed gift bags and tags! I will be there 10am- 3 pm- if you happen to be in the neighbourhood stop on by to say Hi! While all custom orders are now closed- if you are local and like anything you see here or in the Facebook and Etsy shops please just drop me a line- local pick up is available until December 21. This year has been fantastic for me in the studio- I really only have you- all my friends and supporters to Thank! With out you I would not still be out there doing markets and pushing myself to create- Thank You all for your support- monetary and emotional! A big huge Thank You and many, many hugs go out to this amazing community I have found online- I am constantly surprised and humbled by folks who read what I have to say! Thank You Friends! PS- a specific Thank You at Alison for putting up with my constant requests to take pictures of me- like above! Please excuse my super late post this morning- but it is snowing and the snow is sticking! Downtown Vancouver this is a major weather event- we live only a few blocks from the ocean and so while most of the upper levels of this fair city will get a dusting or two of snow a year we rarely do. So it was with great excitement that Miss Lo and I set out to wander Gastown for a bit this morning- I am just as excited as my Littles- then again I don't drive! 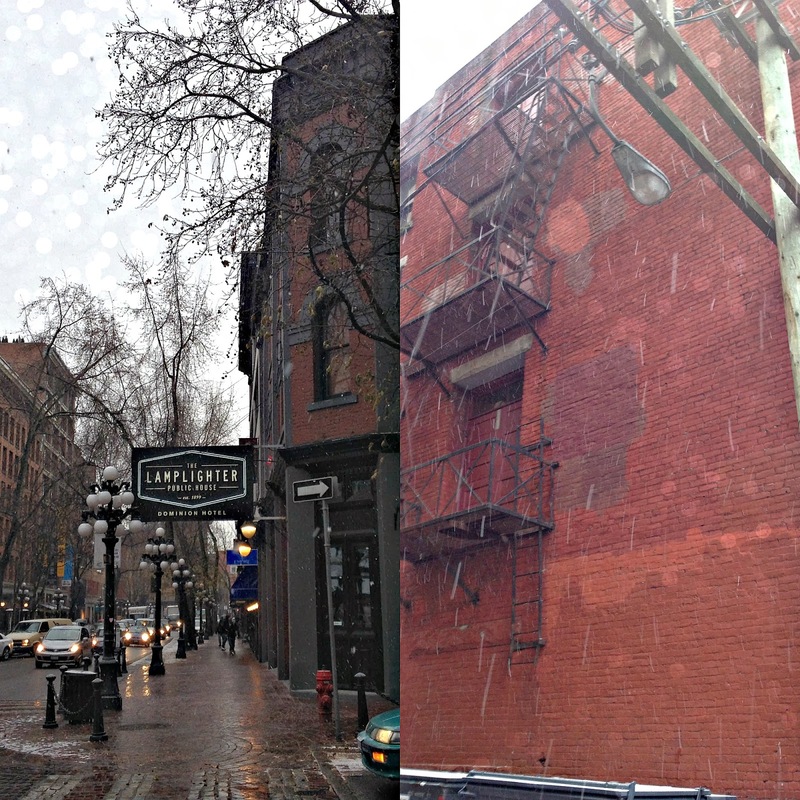 Gastown is a magical place regardless of time of year but there is something so very special about seeing our neighbourhood receiving a fresh coat of snow- mostly untouched- the historical brick buildings catching the snow on their ledges. The first day it snows downtown every person passing us by has a smile on their faces- it is the most perfect of Christmas magic with the lights, trees and now snow! It has been so cold here- which I know will make many of my friends and family across Canada laugh- but it has been cold! 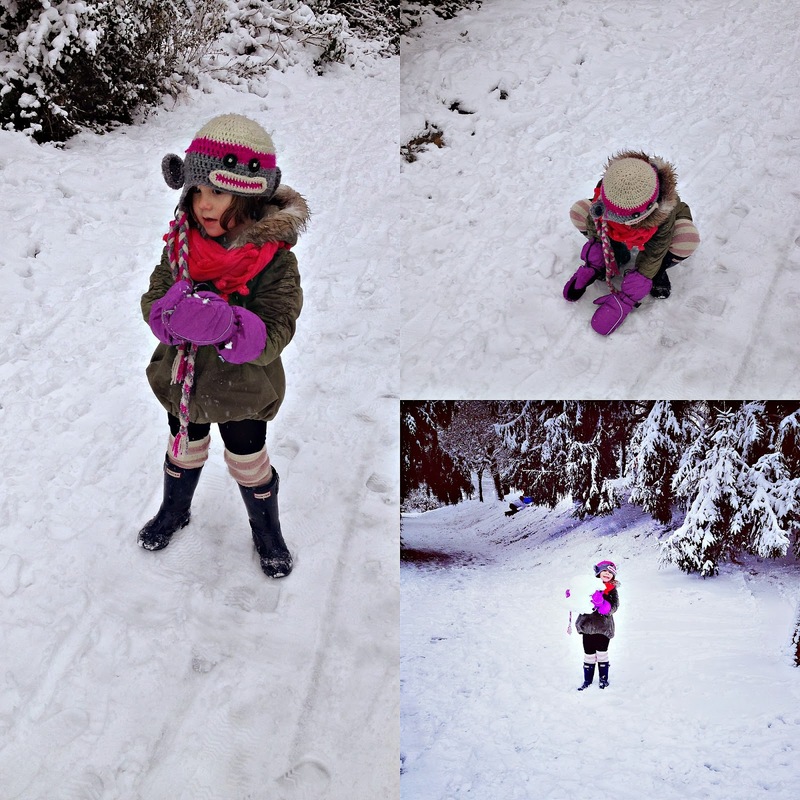 The snow today sort of makes up for the crisp, freezing cold weather- almost like a bit of a reward! I know it is fleeting and is barely sticking around now- so if you need us today we will be outside- catching snowflakes on our tongues and trying to make a snowball! In our family we love Christmas- but for us the best part about the whole day has always been about the stockings. My sister and I loved to get up early and dive into our stockings before breakfast- and we still do- our parents have always done really good stocking- that's where the good stuff like packs of gum and candy were to be found! So it is with this fond childhood memory of thoughtful goodies stuffed down into the toes of our stockings that I am turning my thoughts towards my own children's Christmas stockings- as well as their boots- which will be put out tonight for St. Nicolas of course! Trying to be mindful of what we bring into our home while still providing the Littles with the goodies they crave can be challenging- so I thought I would share my list of favourite stocking stuffers for the Littles- although I feel like almost anyone would enjoy any number of these treats! I'm keeping it simple as per usual- but simple doesn't mean thoughtless- a great deal of thought goes into keeping things simple! - small edible goodies- this seems like a no-brainer but keep it local- hit the Farmer's Market for some yummy, sustainable chocolates, beef jerky or peperoni- or cave aged Greyer- cause who doesn't like cheese in their stocking! - small pots of honey, jams or Nutella- yumm and perfect to eat immediately with breakfast! - art supplies- a fresh pack of soy crayons, glue sticks, fancy pencil sharpener- tape- OK this might be a bit weird but The Boy is getting a roll of his own masking tape in his stocking- he is really into building stuff right now and keeps stealing my tape- so he's getting his own! - colouring books and other creative activity books- our favourites are from a local company called Draw Me A Lion- this year they have come out with a DIY flag book- so fun! - seeds! Visit your local gardening centre and pick up some seeds to start in the window come March- we like Strathcona 1890 Urban Seeds or West Coast Seeds- keeping an eye out for Heritage, non- GMO seeds is key! - beads- OK the parents may not like this but I don't know a gal who doesn't enjoy getting some new beads to make beautiful jewelry with! - books- we read chapter books as a family together and these fit nicely into stockings- this year Jacob Two Two and the Hooded Fang is going into the Boy's stocking! These are just some of my most recent ideas of what might go into our Little's stockings and boots- realistically there will also probably be Lego and stickers- but I think like most things in life a little balance is needed. I would love to hear some of your ideas for stocking stuffers! Does anyone else celebrate St. Nicolas? What's going in your child's boot? Friends it is Friday once again- this weekend will be filled with family and fun for us- my parents are on their way here right now- we will be gathering to celebrate the arrival of Lovely Cousin Laura's new baby- showering her with love. I hope your weekend is filled with warmth and joy- Happy Friday Friends! When I was a kid there was this wondrous place near our house- the Okanagan version of amusement park I guess. It was called Old McDonald's Farm and every time we drove into town my sister and I would start in hope out the window that one day we would stop in. There is only one time I can actually remember going- our Grandma took us- I'm sure our Mom was there as well but I only remember my Grandma- I remember she paid extra so we could fish for carp in the "old fishin' hole"- a nub of bread on the end of a line- I didn't catch anything. I remember getting to pet a baby cow for the first time ever- up until this point cows were large, menacing beings that occasionally escaped their fields and invaded our neighbourhood- I was terrified of them- until I met that calf. The fishing, the calf and being with my Grandma are pretty much all I remember from that day- oh and of course my sister. So obviously Old McDonald's Farm really wasn't all we had thought it would be. Yet it persists as a constant childhood memory because it was just always there hugging the side of the highway- just beyond the empty field with scraggly ponies- the last outpost of town. 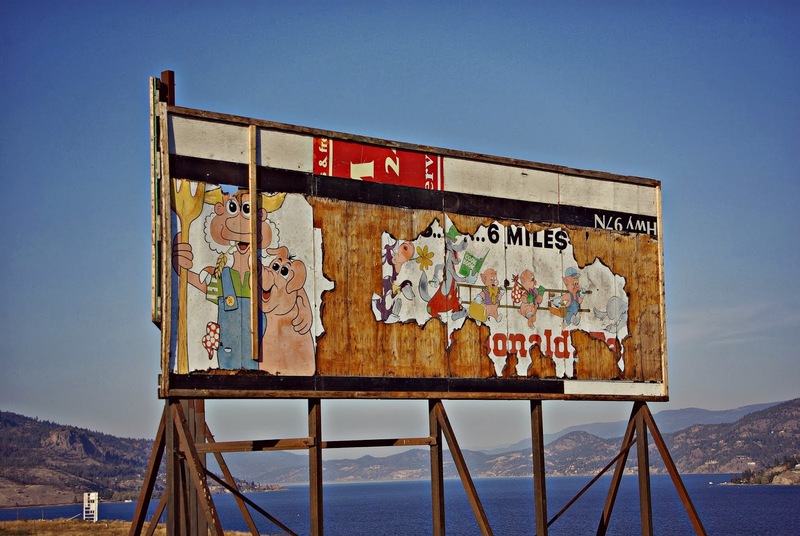 When we went home this past Thanksgiving my Mr. noticed they were changing out one of the billboards on the West side of the bridge- something so familiar caught his eye- causing him to pull over to the shoulder of the road at an alarming rate- I thought something else was wrong with the truck. Then he pointed it out- not much left but just enough to instantly be transported back to childhood- the familiar farmer- assumed to be Old McDonald- and his crazy eyed pig! It's hard to believe that this even still exists- though who knows for how much longer- preserved beneath layers of adds for Okanagan ATV Tours- which is ironically run by a friend of mine. So for whatever reason we just happened to be at the right spot at the right time and we were reminded- if only for a moment- that somethings don't change- they just get buried beneath new layers. I sat down at my laptop to write this morning's missive and just didn't know where to start- so many thoughts and emotions are swirling through my mind it's difficult to sort them all out. 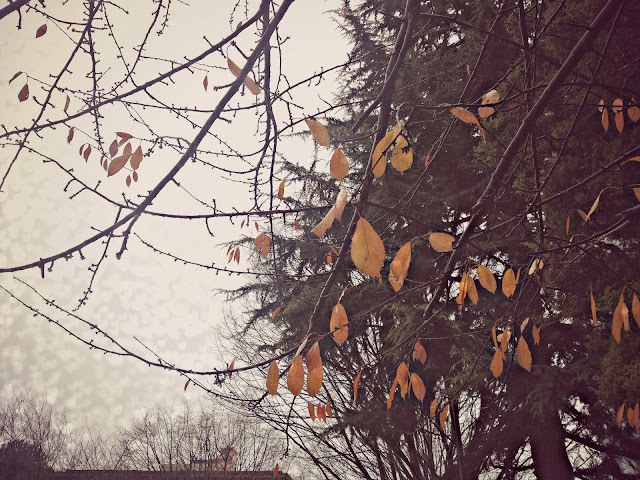 The past few days have been filled with flurry and activity for me and it's not the sort you would expect at this time of year. I don't know if it is a physical reaction to all the consumerism- the Black Friday and Cyber Monday- the Christmas adds- the incessant toy pushing- or maybe it's just the thought of starting off a New Year with a clean (er) slate but I have spent the past few days emptying out closets and under beds- clearing out the clutter even further. I thought we were doing pretty well in the living more simply department- however it turns out I have a real penchant for hoarding- craft supplies, Christmas decorations, old kid's clothing- yup I have been saving it. A good look around our small apartment and you would never know this stuff was in our lives- I am very clever at stashing things away in boxes under the beds and tetris like in the closets. 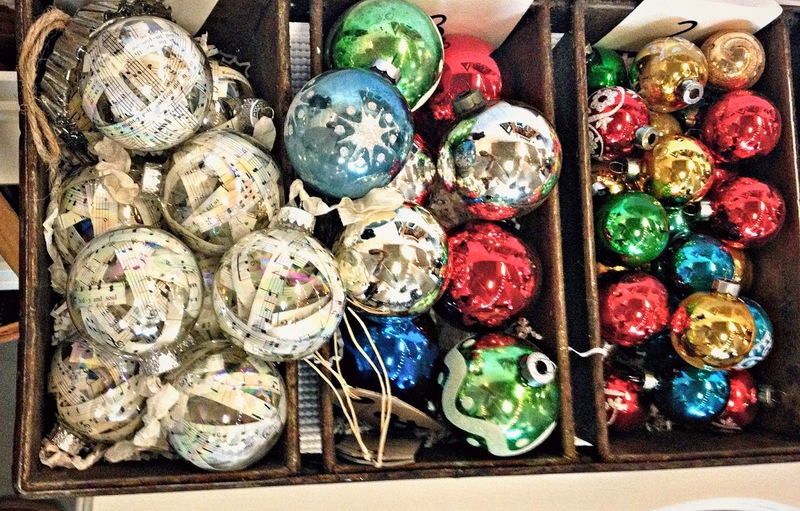 A recent foray under the bed for the Christmas tree (yes we have a fake tree thanks to the by-laws of our building) proved to be eye opening to me- I saw I was hoarding- wait for it- a bunch of empty boxes! This "stuff" weighed heavily on me even though it was out of sight- something had to change. The Mr. and I have been doing a great deal of future planning these days- we are in our mid to late 30's and have started to consider what we want to do in the next ten years- how do we want our children to live? We both agree that it is better to travel this world lightly - filling our children up on experiences instead of being weighed down by things. We want to teach them that joy comes from with in- from a sunrise witnessed over a mountain range or a perfect stretch of deserted beach- joy is the culmination of experiences stored up in our souls- we want to fill up their souls with beauty.
" Joy is no doubt something we all crave more of in our lives. Though closely linked to happiness, joy is something much deeper and longer- lasting. It extends beyond the momentary and lingers around in the every day, and is there when happiness isn't. It's what we all strive for in life, and the good news is that it's certainly within reach"
I think in a world where getting ahead is so revered and people can easily wear their success by sporting popular brands it is so easy to get swept up in going along with everyone else. I know I did- once upon a time I based a great deal of my self worth on how many of my co-workers commented on my new top- it's easy. Not only is it easy- but it's time consuming and quite frankly a bit boring for me- I am opting out of this rat race. So for me getting rid of all this "stuff" has been so cathartic- so lightening- exciting and addicting even! As a family we are going into 2014 living much more lightly- much easier and most of all much more together! My question for you dear readers- how do you clear out the chaos and clutter? I would love for you to share your simple living tips and tricks! 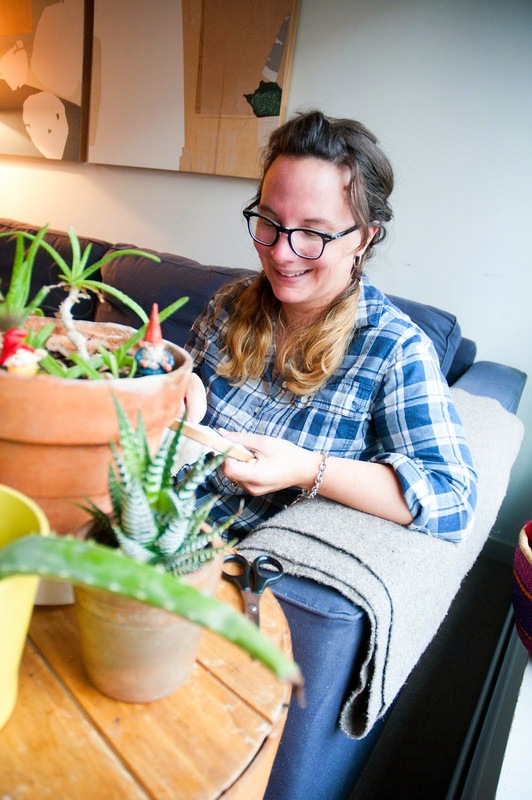 Does simple- minimalist living bring you joy? * for the full article on living a joyful life from Clementine Daily click here! I am a bit fan of working with leather- I love it- there is something that whispers "this is special" about leather. Maybe it is the historical pedigree of leather- it is an ancient and honest material that is tried and true. Perhaps it is the social connotations that leather equals quality goods- I learned at an early age to sniff purses to tell if they were made of leather or not- quality purses are made of leather! Impress all your friends this Holiday season with these arrow inspired key chains- cause you know arrows are super hip right now. 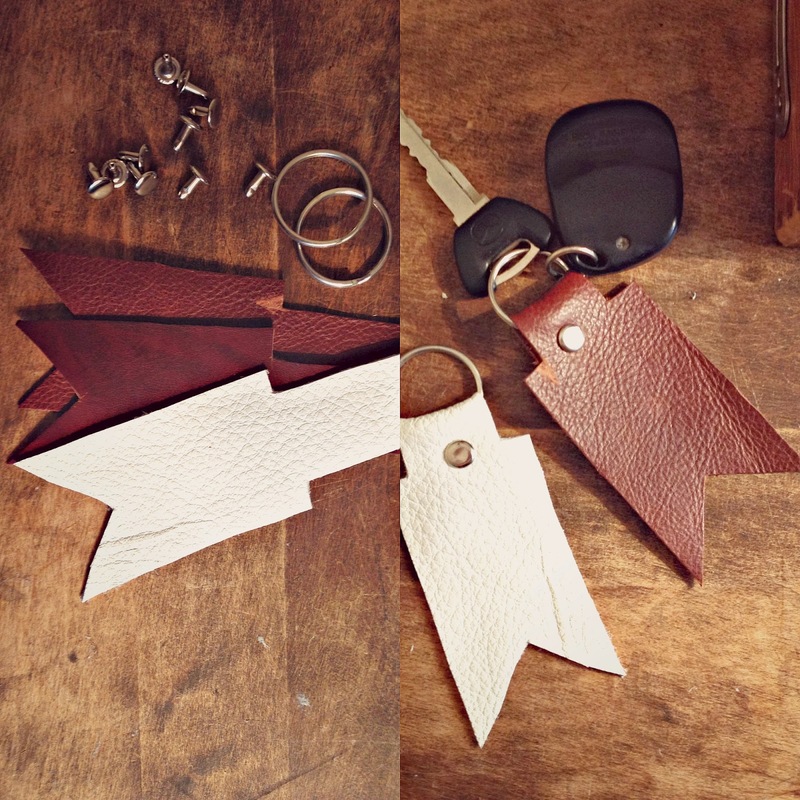 The arrow key chain could not be any easier to make- all you really need is a scrap of leather, a blank key ring, rivets and a hammer- very straight forward! To start with sketch out your design on the back of the leather- taking into account the size of the key ring and narrowing the top of the leather to fit through the ring. Cut out arrow shape. Loop the end of the leather through the key ring- punch a hole through both pieces of leather and insert rivet- add the back of the rivet and hammer into place. I can't think of any hipster dude that would not love getting this leather cheveron key chain in their stocking this Holiday season! I have this super bad habit of always wanting to keep the gifts that I make- this project was great because I easily made about six in a half hour- meaning I get to keep one for myself! So impress your friends- let them think you are very clever- whip up one or a dozen of these hip little key chains! Nestled along the shores of the Fraser River lie some of British Columbia's oldest buildings- Fort Langley also known as The Birthplace of B.C. This past weekend with the grey November skies threatening rain- or snow- we headed out to the valley with some friends to do some exploring of this Provincial historical sight. I had not been inside the actual fort since a visit with my family in the 1980's- what I remember most is watching the blacksmith make square headed nails- I have mine still- in a suitcase amongst my childhood treasures. 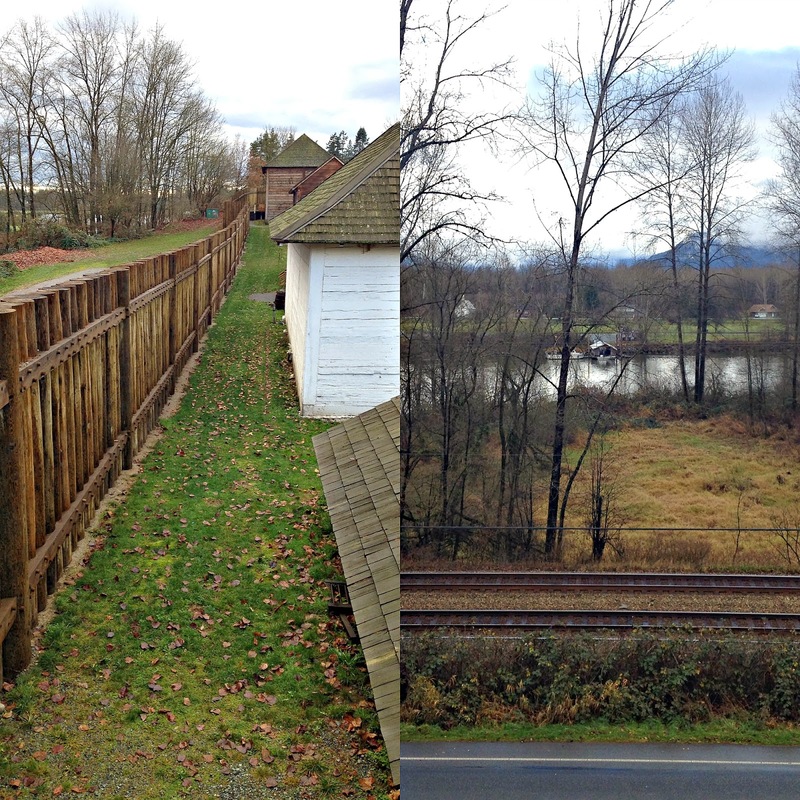 Much has changed since my last visit- gone are the dirt paths and self guided tours- the Fort Langley of today is well paved and easy to get around. Historically accurate tour guides help you find your way around the fort and are on hand to answer the endless questions of little boys. We climbed the bastions and gazed out at the view of the river and fields- wandered through the stock houses and living quarters- imagining what it would be like to live 150 years ago. The highlight for the Littles seemed to be a stop at the black smith shop- where we watched an apprentice black smith make hooks- which each Little got to take home as a souvenir- a treasure for their own collections. Another popular stop was the gold panning station- where we were able to pan for real treasure! This was a great way to spend a few hours on a grey day- the Littles got to learn something and maybe think about how easy our lives are today- compared to life in B.C. a century ad a half ago! 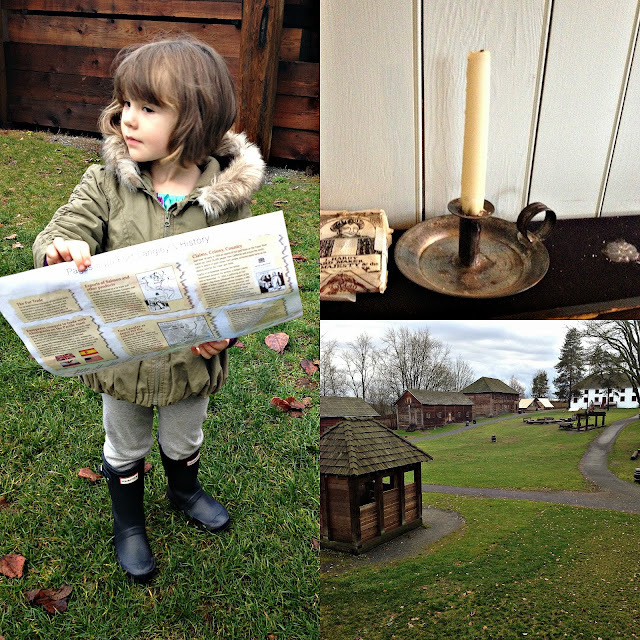 If you decide to visit Fort Langley now is a great time of year- aside from a couple other families we pretty much had the place to ourselves! Children 5 and under are free- a family pass comes in at under $20.00- making this a very affordable family outing. I think what I loved most about this adventure is that it was very hands on- the kids were invited to touch exhibits and explore freely- not something you would find at most museums. 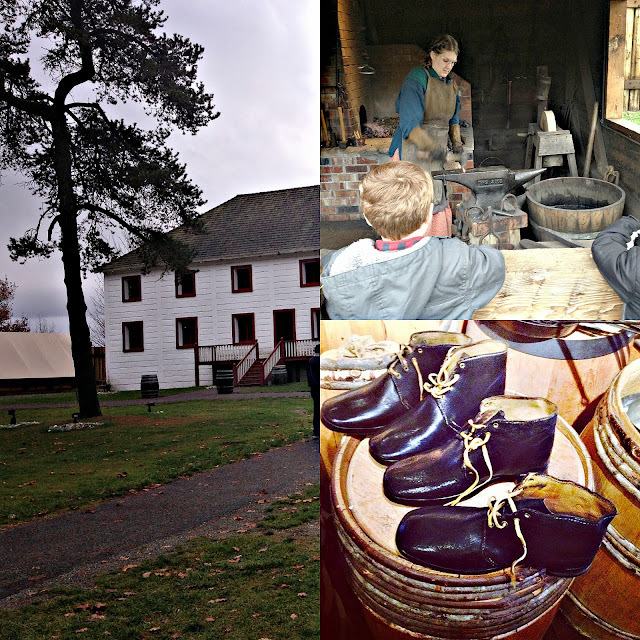 Fort Langley is set up to be very hands on learning- encouraging children to step back in time and experience what life might have been like. Parents can I say there is very little for your kids to get in to trouble with here- wide open spaces to run around and very patient tour guides. This was a great adventure for our busy and inquisitive Littles!